It is a rhymed, usually syllabic calendar, which indicates the fixed feast days of significant saints; it served as a tool for memorizing these fixed clerical dates. The first syllable of the whole name of the saint is written on the calendar for the concerned day. The space between these significant days is filled with syllables that are not related to the saints in such a way that the verses make sense where possible. In poetic terms, this literary form is somewhat clumsy, but it can be easily memorized. Cisiojanuses began to appear approximately since the 12th century (in Bohemia, since 13th century) and were used until the 17th century. The entire year‑round Cisiojanus has 365 syllables; there are Latin, Czech or German versions. After the printing press became popular in the 16th century, printed calendars began to appear and Cisiojanuses gradually ceased to be used. 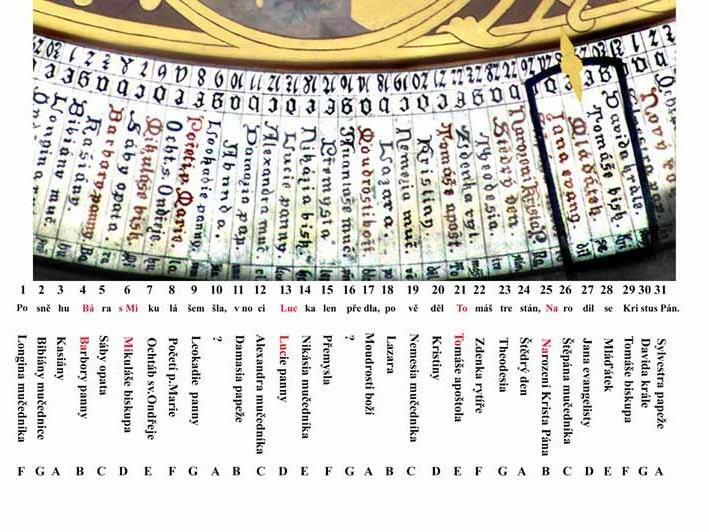 On the calendar plate of the Prague astronomical clock, the syllable are written on the very edge. One of Czech Cisiojanuses is written here, an Old Czech one from the second half of the 16th century. It is a merit of the town archivist, K. J. Erben, that it was used on the clock. As a sample, its December part is deciphered on the photograph; the transcription is: Po - snм - hu - Bб - ra - sMi - ku - lб - љem - љla, v no - ci - Luc - ka - len - pшe - dla, - po - vм - dмl - To - mбљ - tre - stбn: Na - ro - dil - se - Kri - stus - Pбn. Other information related to the dominical letter and basic historical information on calendars can be found in the part dealing with astronomy.